In what seemed like a blink of an eye, a new shopping center materialized at the corner of Barranca and Jamboree. This, of course, is The District –- a puzzling assortment of retail stores, a movie theater, and dining establishments built beneath the shadow of the Tustin blimp hangars. Why is it puzzling? Well, there’s already a Lowes, a Home Depot, a Costco, a Target and a Best Buy just three miles down the road, on the same street no less! Do we really need two of each barely minutes apart? Either the developers have short attention spans or they think we do. But it isn’t all carbon copies of things, at least not of things that already exist within a five mile radius. The first is the new AMC, which, I have to say, is great since all shows before noon on weekends are just six bucks. Regal/Edwards Cinemas' strangle hold on South County residents is now over. And for eats, there’s Lucille’s Smokehouse, which makes two for South Orange County (the other is in Lake Forest). There’s a quaint, rags-to-riches fable written on its website (and its menu) about Lucille Buchanan, its diminutive founder from the South who learned how to make barbecue from her Granny. But let’s get it straight right now: the story is a complete fabrication; a tall-tale; a work of fiction, albeit one crafted by a master stroke of marketing genius. The man behind the curtain is actually an established restaurateur named Craig Hofman, of Hof’s Hut fame. Lucille Buchanan is just as real as Ronald McDonald, and the restaurant can trace it’s humble beginnings all the way back to 1999, when it first opened in the L.B.C. (Long Beach), which means it has more in common with Snoop Dogg than B.B. King. The lore extends to the interior design theme –- a faithful and loving tribute to roadstops seen from Arkansas to North Carolina. There’s Southern kitsch all over the walls; checkered flooring; fanciful illustrations of pigs; and plaques with quotes that sound like they were penned by Mark Twain himself. All of it contributes to a down-home look, requisite charm and warmth not seen west of the Mississippi. Even the drinks are poured into Mason jars. The beverage of choice to sip out of said container? Why, sweet tea ($2.75) of course! And instead of bread, it’s a basket of biscuits with apple butter. 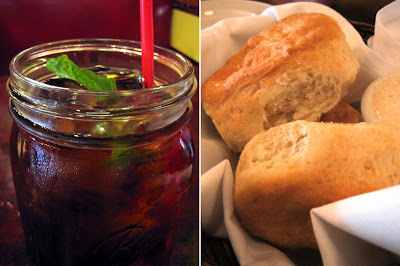 Although I’ve had better biscuits, Lucille’s was fluffy and enjoyable enough to kill your appetite. My warning to you: try a bite, but that's all. The reason? Their portions are designed for Southern appetites, which is to say, they’re huge. The Appetizer Platter ($18.95) was a meal for three onto itself. The best item on the gargantuan plate was the BBQ wings, hickory smoked in Lucille’s big metal contraptions. The fried chicken strips were also surprisingly juicy –- a rare thing to behold since once breast meat is ripped from the carcass, usually dryness inevitably follows. The rest of the crew included more fried foods than a physician would recommend in one sitting: fried green tomatoes; onion straws; stuffed jalapeno; Dixie egg rolls (basically diced chicken and corn inside an egg roll wrapper); and a tri-tip quesadilla, which wasn’t fried exactly but definitely not what you call heart-healthy either. 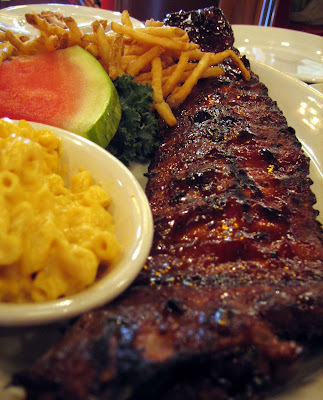 And if your stomach can take it, there’s Lucille’s main attraction: the Baby Back Ribs ($24.95 for a full rack). Now I must preface this part with a disclaimer: I’m not an expert on BBQ. I don’t claim to have ever tasted the barbecue in Kansas City, Memphis, or Texas, but I think I know a good rack of bones when I see one -- and Lucille’s was pretty darn tootin’ great. There’s the meat, which had a pink luster due to the permeation of smoke into each molecule of pork. To say that it's smoky and sweet is probably not necessary. And yes, it's fall-of-the-bone tender. But the best feature of these ribs in my opinion? Those crusty, charred areas -- where pork fat, brown sugar, and carbon fused together to form a tasty burnt mass. In the end, with our fingers throughly gunked and sticky with cue sauce, we resorted to holding the drinks between our palms. By the way, the plate of ribs came with two sides. In our case, mac n’ cheese and fries. The three of us (who shared the meal I’ve thus far chronicled), only managed to make a slight dent in the fries (which were battered, crispy and delightful). The mac n’ cheese was pristinely untouched by the time our bill arrived. And how was Lucille’s “famed” peach cobbler? I have no idea. In the times I’ve patronized the Long Beach and Brea branches, I’ve never made it past half of the main entree. The same goes for this new Tustin store. Someday, I might just cross that finish line and try one of their desserts. On that day, I'll go home on a stretcher. I've been to the Lucille's in the Kook once and only once. I don't really remember what I had, Jambalaya I think, but I didn't finish and wasn't impressed enough to go back. But maybe I should try again and go for some BBQ. Please come back where you belong. I’ll never put you on." Nonetheless, you sure did put away a good amount of food! Being as I was raised in the south I LOVE the fact I can get sweetened tea there. With each delicious sip I wonder why it is that nobody here seems to "get it." Anyway, I hate the sides at Lucille's outside of the fries but the meat is what your there for and for the most part it delivers. The one exception being the chicken which has more akin with astronaut food then good BBQ. I love the kitsch of the Mason jars for drinks! And I really enjoy a good biscuit in lieu of the standard bread. That appetizer platter is massive! I can't believe you guys ate ribs after that. I'd love to try this place and it's only a stone's throw away from where my father lives in Irvine, but that would mean having to actually go out to visit him and my stepmother. Darnit all! I've been to the one in the Long Beach Town Center a few times and as far as chains go, not bad. I do love baby back ribs and that's pretty all I end up getting--I've tried some sandwiches and salads and stuff, and you just don't bother getting stuff like that at places like these. An elastic waistband helps. Those crusty, charred areas -- where pork fat, brown sugar, and carbon fused together to form a tasty burnt mass. thanks for this review! my husband loves good barbecue and I was actually kind of excited to see this place opening nearby. You're right about that. The biscuits aren't worth the space it takes up in your belly. Better to save that prime real estate for the good stuff...mainly, the ribs. Yes definitely. The ribs are the way to go. The Beef Brisket and the Tri Tip were alright -- I tried them a while ago but have since decided that every trip to Lucille's will be a trip for Baby Back Ribs, and only Baby Back Ribs. Hof's Smokehouse...there's a bad David Hassellhoff joke in there somewhere! So true. Love sweet tea. And I'm not from the south. So nice not to have to stir in your own sugar and wait for it dissolve in the ice cold liquid. What's funny is that Nestea has the sweet tea flavor in the South (in cans! ), but not the Lemon-iced-tea they have in the west coast. It actually goes down smoother than the stuff that is pre-spiked with lemon. It's true. Ribs. That's it. The fried chicken might be good judging by the juicyness of the strips I ate, but I had a premonition that the sandwiches and salads might just be ho-hum. Besides. Ribs! The one in Tustin, for now, doesn't seem as crowded as the others (where the wait can be one to two hours). And of course, they don't take reservations. You should try their tri-tip if you haven't already! It's one of my favorites at Lucille's. I love this post :) While there are a few things I agree that Lucille's BBQ can definitely work on (ie, their bbq chicken, mac 'n cheese, grits), their bbq and humongo portions have me coming back for more(esp. the tri-tip, ribs, and sausages!). We were just there last weekend too, I must say that the BBQ chicken was tender and good. 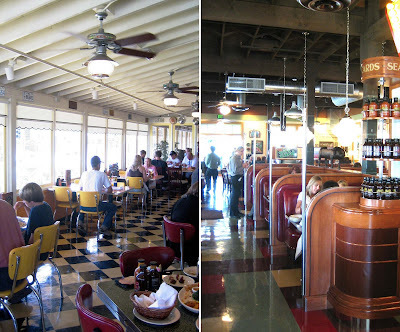 Great photos and review of Lucille's. I've been to the ones in Long Beach and Brea. As another Southerner from da Deep South, I think LSH is pretty dang good. By the way, you can also get sweet tea at the Chicks-fil-a places too! I think LSH is a notch up from Johnny Reb's (especially the one in Orange). Thanks for the heads up on another great eating place in the OC! Sausages! Now that's something I didn't realize they had. MMM. I can taste 'em already. But you're right, stick to the basics and you'll come out ahead. The fried green tomatoes, by the way, were kind of a let down. We might have been there at the same time. Actually, perhaps not...to beat the crowd we ate early, like at 3:30. And still there was a a 10 minute wait. Ah yes, those onion straws are the main reason we ordered that appetizer sampler. They were indeed very good...but the fried chicken strips: c'est magnifique! I gotta say, while I do like the fried green tomatoes at Johnny Rebs (the one in Orange), the ribs and other Southern vittles there aren't as good as LSM. I do like the peanut shells on the floor though. That's a nice touch. I was in the South last week and I should've tried the grits...then do a comparison with Lucille's. Rats. Why didn't I? HAHA! The leftovers made for two more meals! I think there's another Lucille's opening up in Irvine on Jeffrey, in that new center between the Walnut and Irvine Blvd intersections. Thought I was a sign as I was driving past. I just can't trust any eatery associated with Hof's Hut. Two of the worst cases of food poisoning I've ever had (not counting the one where I was bleeding internally) were from the Irvine location on Barranca. I was glad to see them close. Ugh, food poisoning huh? Well that'll put you off Hof's new restaurant incarnate. Wierd that they would put another Lucille's just miles down the road...but then I would've said the same thing about the Home Depots, the Costcos, and the Best Buys. greetings! what a wonderful food blog ! if you like BBQ, you have to check out JOEY'S BBQ over in tustin market place - it just opened the other week. it's where that cajun place used to be, next to rubios, dairy queen, etc. My wife and I ate there last weekend, and we were decidedly unimpressed. To be fair, we're both from the south, we've had great barbeque in a ton of different southern states, and we had just gotten back from a food-oriented honeymoon in South Carolina. But the ribs weren't especially meaty, and they tasted like the sauce had been added at the last second, rather than cooked in for very long. The meat on the pulled pork sandwich was similarly sauce-less. The sauces they had there to add were relatively poor. The "original" was just OK, and the "Memphis" tasted both way too sweet and way too much like the barbeque sauce packets at McDonald's. Also, what's with serving a pulled pork sandwich and not asking if I wanted slaw on it? In the place's favor, the meat was cooked basically to perfection. Also, the sweet tea was pretty good. I thought the Mason jars were goofy, but it was nice that the glass was big enough that I didn't need a refill. Meanwhile, her birthday is coming up soon, and I need a good place to take her out. She likes everything, except that she's really tired of the feeling that everything in Irvine is a chain. I would really appreciate any ideas anyone had. I hope that last bit wasn't offensive, in a "What do you mean, recommendation? Read the archives," sort of way. I've actually been poking around all day, and the problem I had was that there were too many positive reviews to know what's best. Cool! I'll have to check that out, especially since I live close enough to walk there. Welcome to my blog! As far as Irvine eats, what are you in the mood for. Or more importantly, what's the wife in the mood for? Chains rule Irvine. But that's not to say that it's all bad. Houston's is a chain but a good one. But if you weren't impressed with the ribs at Lucille's, you won't like the "Fork and Knife" ribs they have there. But hands down, their French Dip Sandwich is the best around. My recommendation for you though is Agora. It's an all you can eat meat-a-palooza! Agora looks cool, but outside of barbeque my wife doesn't eat tons of red meat. We're both more likely to order fish than steak at most restaurants. Is there any good tapas around here? Her favorite restaurant when we lived in Boston was this awesome tapas place called Dali. There is a restaurant called Tapas in Newport Beach, but I don't recommend that place. The best and probably only decent Spanish place (I think they do Tapas) is a new restaurant called Picante in Ladera Ranch (15-20 minutes from Irvine). CLICK HERE for a review. Just got back into O.C. after a ten year absence. We ate at Lucille's, having come across while exploring the stompin' grounds. Since we just came in from Birmingham and Atlanta and points south, have to say that Lucille's didn't blow my skirt up whatsoever. Yes the portions were impressive; the beef ribs the wife ordered looked like a Fred Flintstone brontosaurus entree'. Not sure what exactly isn't going right ... could be the sauce felt a little "commercial". Went to this place yesterday for dinner. Not very impressed. I'd give it 6 out of 10 for food, 7 out 10 for service and 8.5 for decor. First thing i noticed after i sat down was dirty fork. Asked waitress for another, she came back with another dirty one. Asked again, finally got a decent one. We had salads and 2 combo meals with various kinds of meat. The cesar salad used pretty nasty dressing, probably the cheap ones you can buy at grocery store. The BBQ chicken is very tender and juicy and tates very good. The baby rib and links are ok, tri tip a little bit dry. I have had good BBQ in Texas and Lucille's is no comparison, definitely not worth the $25 for the combo meal. The worst came when i got home, i had minor symptom of food poinsioning. Definitely not going back to this place again. Flew into CA for a B-Day, met lots of friends at Lucille's for dinner. Yum O, ribs were outstanding and Collard greens to die for (being from the South). Look forward to eating there again. When are you going to open ones in AZ? Soon I hope. . .
Lucille's ahas great barbeque chicken, ribs, and generous portions. The only downfall is the atmosphere of the location (I go to the one in the District in Tustin). I don't know if it's because it is new or what, but I've have been here 4 times and each has been plagued with service problems: forgetting orders, not bringing sides, not bringing appetizers, not enough chairs, small and cramped, loud music, lost checks, and the worst of all NO SERVICE. It's a good thing this place has good food, because it would probably be history otherwise. The last time I came here was it, I can only do take out from now on. It's so aggravating that a great food place, has such lousy service. Besides, I then get to eat in my home, watch t.v., lower priced beer. I have two suggestions if you're going to eat here: 1. come with lots of patience, 2. eat take out. Went to the Brea location with my girlfriend on 9/14/08 and we both woke up the next morning vomitting from food poisoning. We are positive it was from the restaurant because we didn't see each other for several days until that meal and we didn't eat anything afterwards.